There were a total of 344 reported homicides for a rate of 55.1 homicides per 100,000 residents. This would make Baltimore the deadliest city in America based on per capita rates. The deadliest month in 2015 was July both in terms of actual homicides reported (45) and homicides per day (1.45). The calmest month in 2015 was February, with 13 homicides for the month (about 0.46 per day). The deadliest day of the week was Sunday, with 65 of 344 (19%) homicides happening on that day. Tuesdays and Fridays were the calmest, with 46 (13%) homicides on Tuesdays or Fridays. The longest streak of days without homicides happened between February 4 and February 10, when there were no homicides for seven days. The longest streak of days with at least one homicide happened between July 21 and August 2, when there were 13 days in which 21 homicides occurred. There were three non-consecutive weeks with only one homicide. No week went by without at least one homicide. Most of the homicides occurred in the evening and overnight hours. Between 7pm and 6am, 56% of all homicides were reported. The morning hours between 6am and noon were the calmest, with 12% of homicides for the year happening in that time. The hour between 5am and 6am was the most quiet one, with only one homicide reported in that hour during the year. 134 neighborhoods in Baltimore saw at least one homicide. Sandtown-Winchester saw the most homicides (12) of all neighborhoods and had a homicide rate of 140.6 homicides per 100,000 residents for the year. The neighborhood with the highest rate per 100,000 residents is Dickeyville with 1,282.1 homicides per 100,000 residents in 2015, where two homicides occurred in that neighborhood of 156 residents (according to the 2010 US Census). Five industrial areas had 9 homicide victims located within them. These industrial areas officially have a population of zero. 87% of homicides in 2015 were done by firearm. 8% by knife. The rest (5%) were done by other methods such as blunt force trauma, asphyxiation, etc. 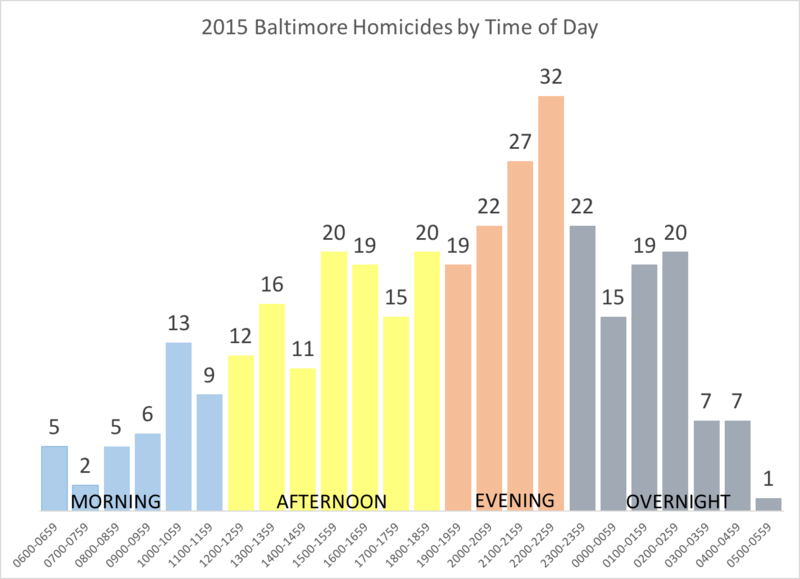 The average age of a homicide victim in Baltimore in 2015 was 30 years of age. The youngest victim was a few days old while the oldest was 71 years old. By age group, the age group consisting of people between 25 and 35 years of age had 132 victims (38% of total). Children under 18 years of age accounted for 24 victims (7% of total). *Special thanks to everyone who collaborated on putting this together.